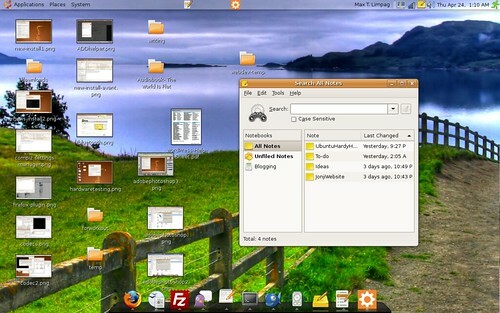 Today, the new Ubuntu Linux version—8.04 the Hardy Heron—will be released. I have been using the beta or test version for the last two weeks and have found Ubuntu to be easier to use and install and its whole computing experience better than ever. I had initially decided to stay away from using the beta version—the amount of updates you have to download on the run-up to the final version can be huge. I had several urgent tasks and didn’t want to deal with regularly updating my laptop. HARDY HERON running on my MSI S260 laptop. Click to enlarge photo. But Chin Wong made me do it. The devil, in turn, made him do it, or at least that line kept playing in his head as he installed the beta version in his desktop computer. During the installation, he had problems with sound in his system. A day later, however, he posted a fix to the problem. That broke my resolve to stay away from the Hardy Heron beta and proceeded to install it, as opposed to upgrade, in my MSI S260 laptop. I use Aptana whenever I have to edit a web template or convert one to a WordPress theme. Before I found Aptana, I used Dreamweaver. I wrote a post earlier on how to use Dreamweaver to edit edit WordPress themes. EDITING WITH APTANA. Porting an open source web template into a WordPress theme using Aptana. Here, Aptana is showing a preview of the design. Click on photo to view larger image. When I found Aptana, however, I dumped Dreamweaver. I found Aptana, an open source integrated development environment or IDE, to be a better tool to edit CSS and HTML files. I sometimes use it to edit WordPress .php theme files although my editor of choice right now is gedit. While Dreamweaver is easier to use for non-geeks like me who are not as adept in coding, using Aptana allows me to improve my HTML and CSS skills. You can’t drag things around to re-arrange web page elements as you do in Dreamweaver. You have to do the changes by code. When I migrated to Ubuntu Linux in my laptop, I knew I had to install Aptana or else I’d have to go to my Windows desktop to work on web templates. Installing Aptana in Windows is painless. You just need to download the installer package and run it. Among blogging applications, WordPress probably has the largest number of great-looking themes to use. Still, there are hundreds of free and even open source web templates not yet converted to work with WordPress. Knowing how to make this themes work with WordPress broadens your choice of design to use for your blog. Converting a web template is fairly easy if you take the time to learn how to do it. I wrote this guide for someone like me a few months back — eager to use a great looking web design and yet not knowing how to start converting it to work with WordPress. If you want to view a video tutorial on how I turned this open source web design into this WordPress theme, click here for the blog post. Knowing how to turn any web template into a WordPress theme broadens your choice of designs to use for your blog. I created this video tutorial for someone like me a few months back: eager to attempt turning a great looking open source web template into a WordPress theme but not knowing how to start. If you want to read a tutorial based on the screencast, click here. For the screencast, I turned this open source web template into this WordPress theme. The video tutorial ends with the creation of the different WordPress theme files. The part when I activated the theme, tweaked it, and fixed errors wasn’t captured as I ran out of virtual memory. 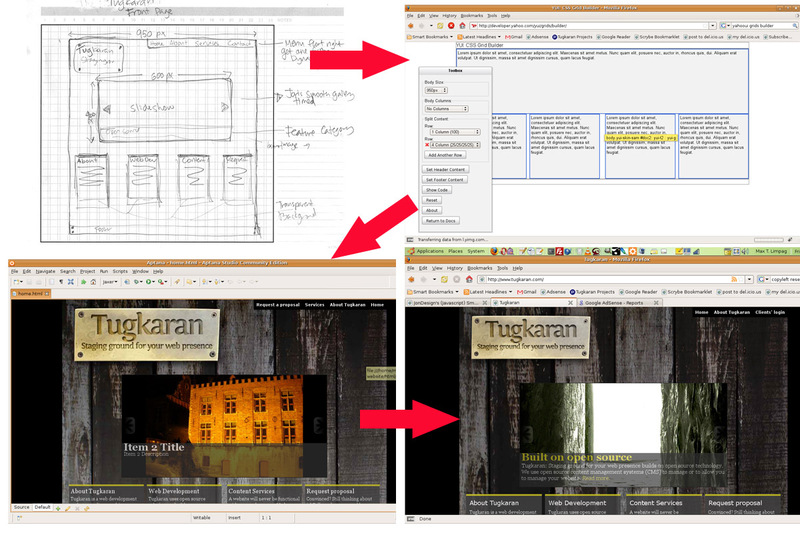 I just included notes on the tweaking after the screencast below.